Imagine running your own fashion boutique with cozy chairs, hot coffee, and ambient music. Meet Jane, a savvy fashionista, determined to make a name for herself in the fashion biz. Start small and provide top-notch service to clients - then upgrade your boutique with more fitting rooms, a sleeker design, and a fat cash register. Sell the hottest collections and offer 130 distinct clothing options to customers. Can Jane manage the Dress Up Rush in this Time Management venture? Dress Up Rush is rated 2.8 out of 5 by 8. Rated 4 out of 5 by enmpedi81 from addictive absolutely loved it! it is so addictive. I found myself playing for hours. Rated 3 out of 5 by Pucktweety from Fun game This is a light hearted fun game that requires not that much brain power but still provides a bit of fun. My main problems where the fact it never got hard enough for me. As a seasoned BFG gamer it didn't challenge me enough and the prospects for replaying are not good as by the end (which really didn't take that long for me) I wasn't in the mood to play any more of it and I haven't revisited it since. In theory it has great potential but it just doesn't deliver an exciting game. Rated 3 out of 5 by diggerdog01 from fashion rush good, i really like time management games, depends what mood you are in, also hidden object games. Rated 2 out of 5 by JibbyEllison from Dress Up Rush??? 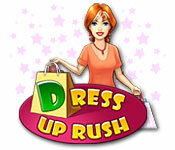 Dress up Rush is a game where Jane (You) open a fashion shop, due to what your friend said about the bikini you made. In your shop, you have to give customers magazines and coffee, etc. Give them what clothes they want. Sew them clothes, gift wrap them clothes, wait for them to finish in the changing rooms, etc. You can upgrade the shop and the clothes and that's basically it. The game is quite boring because it is very repetitive! The graphics are good, however one item of the screen is the colour, for example there isn't any patterened clothes or decor. If I had to recommened this game, I would recommened it to 7-14 year old girls who like fashion and waiting on people, however I am 11 and I didn't like this game! Rated 2 out of 5 by earthgirl09 from Easy & Dull The game starts off interesting, and you get to purchase upgrades to your fashion store and buy new clothing designs. However, there is hardly any storyline, and each level is exactly the same as the one before. While it is cool to choose later on if you want your store to be all boys, all girls, or both styles of clothing, but there is nothing in between. No challenge, easy to beat. Oh, and if you play a level, and you lose. Say the goal was originally 1,070. Well, when you replay that level, the goal could rise up to 1,130! That happens alot in this game and I thought it was ridiculous. Plus, you play as Jane, and she moves so slow, and the customers get angry so quickly! Definitely try it before you buy it. 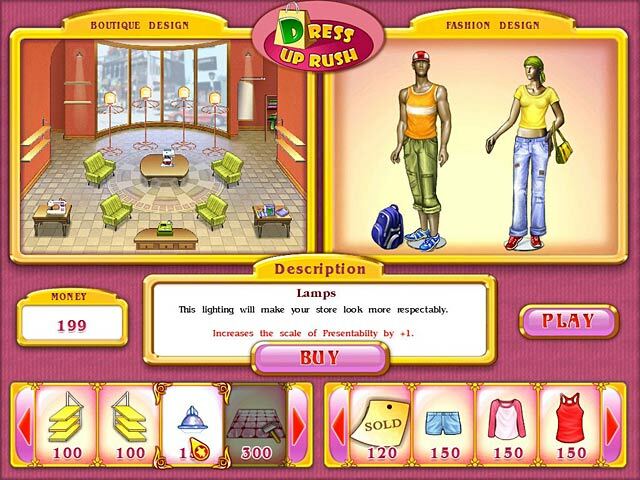 Rated 1 out of 5 by vertam from Dress Up Rush Very short and if you get to far ahead of the girl things get stuck in her hands and you can't get read of them until you lose the level.